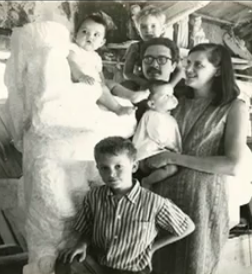 They have put a video up about my father on YouTube, Fantastical Faces of Peter Rockwell: A Sculptor’s Retrospective. There is even a picture with me as a young boy (see above.) I’m the oldest child out in front looking serious. It is strange to be proud of your father, but I am. It shouldn’t take a video.